Tales of VS is obviously made for those who are already franchise fans, or perhaps more accurately, freaking Tales historians. We’re not just talking about including some main characters from the biggest games, there are a lot of unexpected presences. To the non-Japanese fan, things might get a little confusing, as it also packs in characters from Tales games that never went international, of which there are many. (I particularly enjoyed the ability to play as awesome villain Dhaos.) 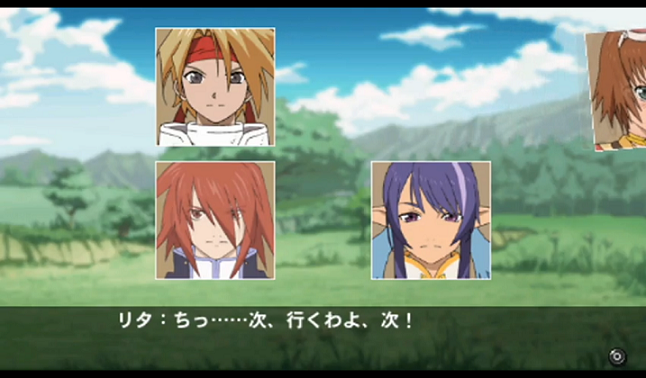 Faces from Tales of Rebirth, Tales of Innocence, and Tales of Hearts show up, just to name a few. If its target audience wasn’t obvious enough from just knowing what the game is, it becomes painfully clear when realizing a game made up of dozens of characters that will only confuse series newbs. Some characters are limited to only specific modes, but combining all available, 50 characters appear in Tales of VS. The most important part of the game, naturally, would be the fighting. 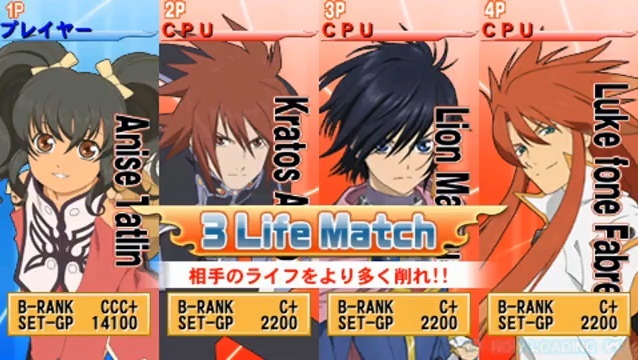 Featuring up to four simultaneous combatants, Tales of VS puts players into large 2D stages with multiple vertical levels. While there are multiple floors, they can easily be jumped through or in reverse, characters can drop directly down through them. There’s a somewhat annoying hitch when trying to do the latter, however, as the character does some kind of little stutter-step before dropping down, making sweet ninja drop attack action nearly impossible. But there are bigger problems with the fighting, or maybe not “problems” so much as a lack of any real rhythm or flow to the combat system. What keeps water polo from being more popular is that it’s hard to transition from fast to slow, or from one direction to another, because the game takes place in a swimming pool. Tales of VS suffers similar problems with its flow, as transitioning from one move to another seems slow and clunky compared to other, smoother fighting games. Jumping feels odd, as there are weird points at which it seems like the character should start falling but just keeps kind of floating, as if someone flipped a Moon Gravity switch just as the character’s feet left the ground. It takes away from how swiftly the player can move about the stage and lowers the intensity and fun that should be near-constant in a fighter. It’d be one thing if the stages were some kind of huge 3D arenas with some kind of strategic reason to go hopping about, but there’s really not much reason for such gallivanting in these mostly empty levels. 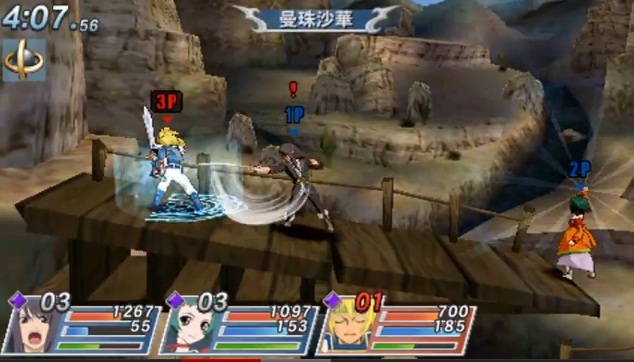 In rival four-player PSP fighter Power Stone, for example, there are weapons, power-ups, and other stage-specific reasons to strategically pull away from the epicenter of the fray. Not so much in Tales of VS, as the only reason I can figure for having such big arenas is simply to give everyone enough space to duke it out; after all, when the action is at its fastest, it can be pretty hard to follow what the heck is happening on-screen. Sure, there are levels that have rolling rocks or other obstacles, but they end up doing little to infuse variety into the fights. As a game specifically for Tales fanservice, this system is passable, but as a pure fighting game, there’s not enough to the actual combat. Visuals in VS look great, especially considering that so many of its source characters originate in games from different eras, on different systems, and in some cases, even by different artists. 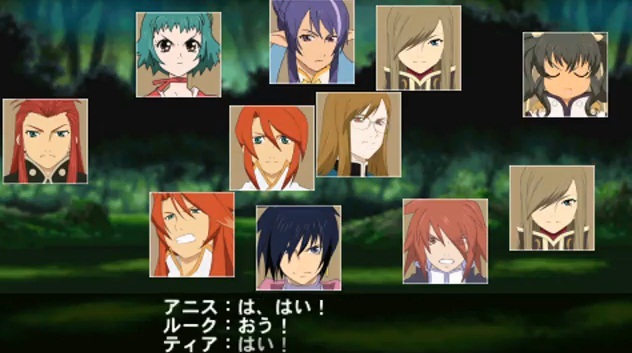 During the fighting itself as well as portrait-heavy story mode, all characters have their signature looks about them while still fitting into the Tales mould. Backgrounds serve the game well, providing pleasant backdrops for the mayhem that will occupy the foreground. Most game modes expected of any fighting game are present such as the ability to take on a continuous line of CPU opponents in arcade mode, time to practice in Training Mode, putting one’s skills to the ultimate test in Survival Mode, a frantic Quick Death Mode in which everyone starts with 1 HP, a Gummi Capture Mode, and a story-driven mode called “Yggdrasil Mode.” Just don’t expect to be able to choose your character in all of them; a few side modes automatically assign a random character to the player, which is annoying. Tipping its hat to the Tales RPGs, Customization Mode lets players upgrade characters by getting good grades after winning battles. Tales of Wallbreaker is a minigame in which players need to work opponents near one of two walls and then smash the fools into it until it breaks. Interesting for a brief gaming session or two, but the fun doesn’t hold up too long. Yggdrasil Mode, a renaming of this game’s story mode, is called such because the game’s overarching story is that a few nations are having a fighting tournament to win rights to harvest the great Yggdrasil’s seeds. It seemed a better conclusion than war. Players begin story mode by picking a pair of characters (from a list of pre-determined duos) and embarking on a journey across a world map in the fashion handled by a lot of tactical RPGs; the on-screen character moves along a series of dots in order to travel. It’s not what the Tales JRPGs are accustomed to, but of course, the point of this game is the fighting, not role-playing stuff. That said, there is one thing in common with the RPG end of things on the map, and that’s random battles. While traveling along the dots making their way from point A to point B, the player’s tandem will sometimes be jumped by random foes such as “Monk” and “Sword Man.” It’s a random encounter like those found on RPG world maps, but the fighting is done in the style of a 2-on-2 fighting game — an interesting concept, but after a few chapters of story, one might grow wary of just how long it takes to win a battle, even against easy enemies. Be cautious, reader, and know that your reviewer here is more sensitive to this kind of thing than most people. I don’t like spending a lot of time ousting my opponents when they offer little or no real challenge. Some of these random battles in story mode can take three or four minutes, even when powerful characters are matched up against total clowns. That’s a long, long time for what amounts to pretty much a useless, unimportant battle with minimal fun due to its lack of challenge. They can be seen as great practice early on, but after a while they just get stupid. As expected, the player will have to win numerous fights in order to clear any given chapter of a story, but story mode provides a — wait for it — story about why the key battles are happening in the first place. Players will often see a conflict, hear some characters shout at each other, see one try and steal from another and then bam, it’s go time. During the conversational parts of the story, character sprites are not seen on-screen, but instead they’re represented by their portraits. The facial expressions will change to reflect their mood and tone, and things like walking and running are handled with side-to-side motion of the otherwise still photos. For example, if Rita runs away from Cless, we won’t actually see her character run, but we’ll see her expression change a bit, then the same neck-up image simply slide from the middle of the screen to the right side and disappear. It’s kind of like those puppet shows where you’ve got a face glued to a Popsicle stick. Along with a few other handheld RPGs, Valkyria Chronicles 2 used a very similar system during a lot of its less-important dialogue scenes. Even the Tales series itself has used a storytelling model like this in its “skits” in past games. Tales fans will of course find most of these sequences pretty entertaining. Careful though, as this is where importing gets tricky. A lot of dialogue is voiced, but there are also big chunks of it that are not, so those who want to understand every detail of what’s going on will have some trouble if they lack a solid grip on written Japanese. The script doesn’t hold back many kanji, so one might have to be ready with something like a word tank on the side. But for those who can brave the waters, they’ll get plenty of quirky little interactions between the heroes of different Tales games. Cast members from one game will bump into those from another, sometimes with a friendly outcome or just as often, resulting in a fight. VS has the ability for up to four human players to fight against one another, either every man for himself or in two teams of two players each. Different sets of rules can also be set, such as the number of HP losses it takes until KO, and whether a win is determined by points or by knocking other players out. The huge downfall of this is that it requires each player to have a UMD of the game, which will add up to a huge cost for importers, if they want to play with local friends. There’s never anyone online looking to play this game, so local is most people’s best shot. While its contents could have been somewhat snipped for leechers who don’t have a disc themselves, at least ToVS should have let multiple humans get in on some part of the action with only one copy of the game. Having four PSPs around is tough enough, but man, requiring four copies of an obscure game like Tales of VS in order to enjoy it completely? That’s a downer. The appeal of Tales of VS is almost exclusive to Tales fans. They’ll no doubt find some measure of joy seeing cast members from the long-respected RPG series interact with each other, make unorthodox teams, and even cross swords with one another. How cool is that? But outside of that, there’s honestly not a whole lot of fun to be had, especially long-term. The fighting — its most important aspect — feels awkward and is hard to get into, despite its tendency to look like an epic battle peeled right from a Tales RPG. 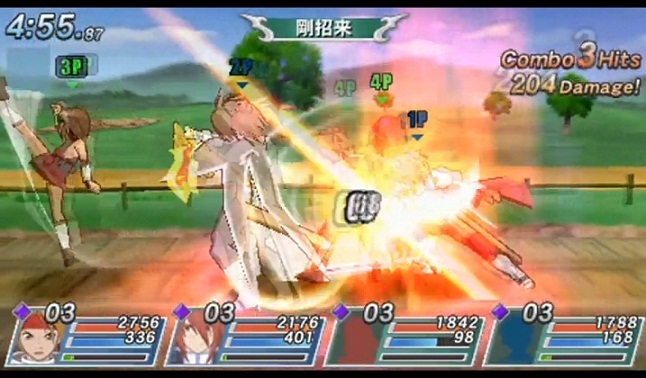 Without that ever-important interest in the Tales characters, this game can’t hold a candle to other PSP-based multiplayer fighters such as Power Stone Collection. Tales fans might have some reason to import this interesting spinoff, and the ones who can understand some Japanese would get a few smiles out of the story mode, but without the appeal of fanservice, we’re left with a fighting game that gets boring quickly. – Never a good thing for the battle system to be an afterthought of a fighting game.